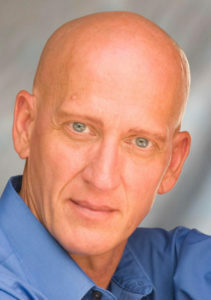 David has been a professional actor since 1991, specializing in Shakespeare and modern/contemporary dramas. 2001–08, he was a member of the Blackfriars Resident Troupe of the American Shakespeare Center, performing 90+ roles including Shylock, Prospero, Cassius, Claudius, Lord Capulet, Richard II, and Ebenezer Scrooge. In Charleston, he has performed with Charleston Stage, Footlight Players, Pure Theatre, Woolfe Street Playhouse, and Midtown Productions. For Charleston Stage, where he is a company member, he most recently appeared as Lord Aster in Peter and the Starcatcher, Prof. Van Helsing in Dracula, and Robert Figg in The Seat of Justice.